I started learning guitar from March '17. And I have just started learning chords. And I am facing a lot of difficulties. The most important of them is that, irrespective of how I place my fingers, there is almost always at least one finger touching an adjacent string and ruining the note. What do you think? Also worth mentioning that my guitar is a steel string acoustic and only a few months old. I have practised chords only for one week. Do you think this can be got rid off by further practice? Fear not. You can learn to play very well with fat fingers! I know from personal experience. I am cursed with short fat fingers and when first learning to play chords I experienced the same thing you are experiencing. In fact I believe all beginning guitarist experience this to a certain degree. As others have mentioned, you might try other guitars with wider string spacing which will allow more room between strings. I have guitars which are more comfortable for me to play than others. But with practice, I have developed the ability to cleanly fret chords on guitars with the narrowest of string spacing (in spite of my fat fingers). As you probably know, when possible, your angle of attack on the strings should be with your fingertip perpendicular to the fretboard. Obviously to do this your fingernails must be very closely trimmed. Not every chord can be played with a perpendicular finger placement on every fretted string. On some chords you may need to find an alternate finger placement that works. On some chords you might have to slant one or more fingers and contact the string with the side of your fingertip. In addition to finger placement and angle of attack, the other thing you might need to adjust is your thumb position on the back of the neck. I find that to cleanly play certain chords without muting strings I am constantly readjusting my thumb position on the back of the neck. Every chord formation gets its own thumb position. It will eventually become very intuitive to include the thumb position for certain chords as part of the finger position for that formation. For example, I know when I play an open E major chord I need to shift my thumb to the treble side of the back of the neck to get my fingers oriented perpendicular to the fretboard. So while my fingers are forming the correct position in mid air - my wrist is rotating so my thumb can slide closer to the treble side of the neck. When I play an open D major chord, my thumb is pointed straight up at the ceiling and the tip of my thumb is not even on the back of the neck. The C chord finds my thumb more parallel with the neck of the guitar. In essence, every chord formation involves getting your fingers in the correct position AND a concurrent adjustment in your wrist orientation and thumb placement and orientation on the back of the neck. So it's not just learning the finger positioning. You will eventually internalize the subconscious adjustment of every part of your wrist and hand for each chord. It's not as difficult as it sounds and with practice - becomes automatic. Try different thumb positions and thumb orientations and different wrist positions with the chords that are giving you trouble. You may find that a shift in thumb position or or wrist angle might make it easier to get your fingers where they need to be. Other guitarist may be able to show you what they do on certain chords and a teacher might help you with alternate positioning. But everyone's anatomy is different so ultimately you must discover what works best for you. Take it one three chord progression at a time so you don't get overwhelmed. With practice (and a guitar suited to your personal comfort) you will eventually be playing all chords cleanly. Enjoy the journey! And how big is a usual finger? 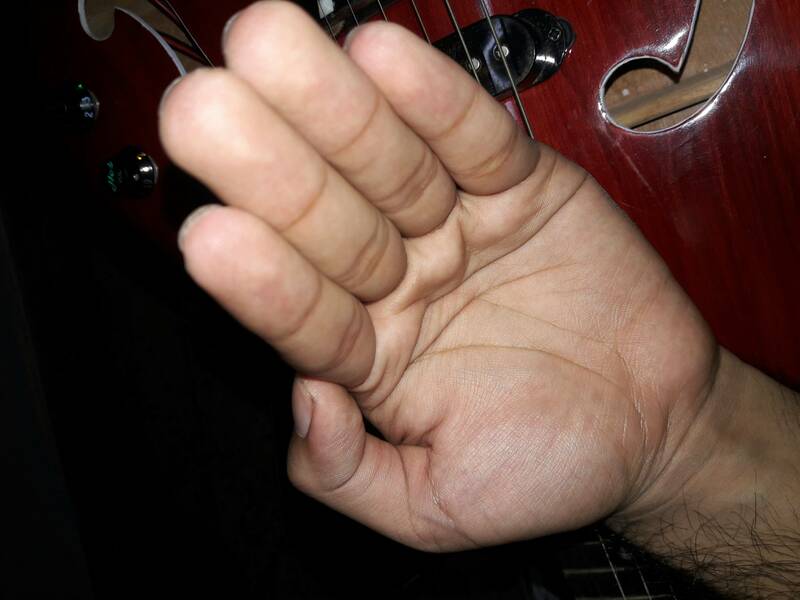 Out of the tens of thousands of guitar players, there a so many different finger sizes that the size becomes not that important. You're only tickling the surface yet, so stick with it. Experiment - there are lots of chords that use two adjacent strings pressed on the same fret. That's great for you - you can probably play the two with one finger! Only use the tips for most chords, and you, like everyone else, will have to fiddle around to get your fingers to not overlap onto neighbouring strings. There is a faint possibility that you have a guitar with a narrow fingerboard, which a teacher or music shop could verify, in which case, a change may be needed. Hard to tell for sure from the picture. But if you use a classical-style left hand, with your thumb halfway up the back of the neck and your fingers attacking at a 90° angle, you'll still be better off than most players. That's the ideal technique for a handful of reasons, including that it helps you avoid hitting adjacent strings, but most players don't do it. Also, guitar necks come in a range of widths. Most steel string acoustics are more or less designed for playing with a pick. But there are also plenty that are designed for fingerstyle, and they tend to have wider necks to make things easier on your right hand. So if you use a wide-necked guitar, you should do just as well as someone with average fingertips on a narrow-necked guitar. You're also going to have some advantages. As Tim mentions, it will be way easier to fret two neighboring strings with the same finger. Also, having big fingertips makes it easier to mute strings on purpose when playing with a pick. A lot of chords require fretting a note and intentionally touching a neighboring string with the same finger to mute it. People with normal-sized fingertips often resort to letting the left hand slop down to make it easier to touch the neighboring string. You'll be able to do it with no effort. Also, you'll probably find it easy to fret a note and mute a higher (further from the floor) string, which for most people is almost an advanced technique because it's not possible to "cheat" by tipping the left hand down. If you're playing with a pick and learn good technique from the start, these advantages should pretty much cancel out any downsides, especially if you play on a wide-necked instrument. I will admit to having mutually called it quits with one student, whose fingers were so chunky and heavily calloused that he could neither fit his fingers on individual strings nor feel what particular part of his finger was in contact with the string. And there lies the difference with you. Sure, your fingers look thick, but they don't look heavily calloused. With time and plenty of practice you should be able to work out the best angle and finger pressure for fretting notes effectively. Obviously , a classical style guitar neck will suit you more than a Stratocaster. Have you noticed how narrow violin fingerboards are? The string spacing appears to be designed for babies, but generations of folk fiddlers with work-forged hands the size of baseball gloves have managed to scratch out some pretty impressive tunes. Stick with it. Or maybe the bass is your instrument. here's a thing what it do. instead of pressing the string entirely with my finger I place the finger way above the actual string and below the adjacent to the one I have to play until and unless my fingernail is just a teeny tiny bit apart from the string( I actually have to play the string below this one). so what basically happens is I ensure that the fleshy side of my finger is not touching the one below(which creates 90% of bad noises) while you master the art of keeping your fingernail from the string above and whats more at beginner level even if your fingernail touches then also it doesn't create that bad a sound than when the flesh of the finger touches it. Not the answer you're looking for? Browse other questions tagged guitar chords acoustic-guitar fretboard or ask your own question. How do I stop muting nearby strings or will my fingers reshape after some practice? New guitar player- having trouble! Is it ok to touch neighbouring strings in guitar while playing scales?